Configured by a Reliable Controls Authorized Dealer, the myControl® mobile app offers fully customized mobile interfaces to any Reliable Controls MACH-System™. Reliable Controls is pleased to announce the release of myControl®, a fully customized, mobile interface for the MACH-SystemTM. This app is compatible with both Android and iOS operating systems, and can be downloaded from either the Google Play Store or Apple App Store. The myControl user interface provides individual personal control for occupants through accessible settings for occupancy, temperature, lighting, ventilation, and more. Having personal access offers user empowerment and accountability, as well as the potential for additional energy savings. 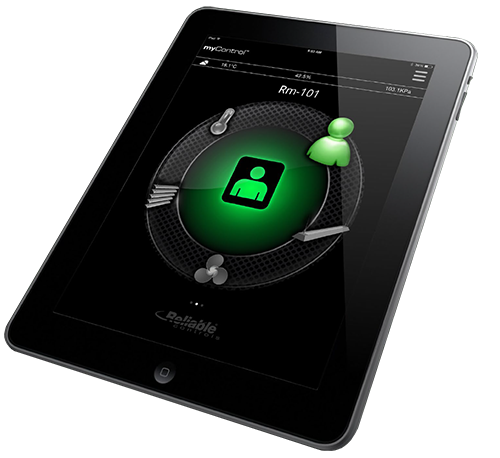 The myControl app allows occupants to dynamically adjust their individual comfort settings while providing owners and operators with the energy savings they require to run an efficient facility.